Boho Farm and Home: Happy 100th Birthday and Bon Appétit! Happy 100th Birthday and Bon Appétit! 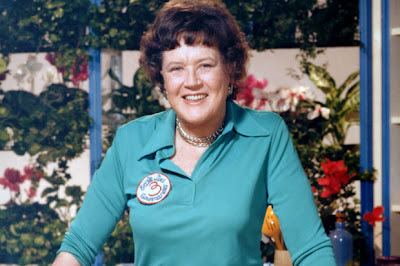 I love Julia Child on many levels and it is not just her food. and try something new and to this 40 something women that is SO encouraging! followed a dream and it was later in life. have gotten older, my love, admiration and appreciation of her has grown. almost 16 year old wondering if her Henry V book has arrived yet. there is still time...to keep growing, learning, exploring and experiencing this beautiful world. Happy 100th Birthday to you, Julia and thank you for your inspirational life. You made this world a better place and for that I am so grateful! Julia is a great role model to all of us! If we only can achieve a little of what she's accomplished: WOW! Caroline there you are, I hope you're having a wonderful summer! I love Julia she's the reason I started cooking in the first place! You are never to old to do anything I have a neigh bor who got her law degree at 60!